Tornado M20 is an advanced VoIP and Video phone designed to meet the growing communication needs of consumers and businesses. It offers complete set of IP Centrex/PBX features and advanced video conferencing capabilities for more complete communication experience. Additionally, Tornado M20 offers a number of value added features such as voicemail with local message storage, chat, email, news, local weather information, and many more. Tornado M20 IP Video Phone offers a color LCD display which provides users with a feature-rich phone management interface. The display can be also used for Video-on-Demand content presentation such as video streaming, video training, video conferencing, video telephony, video training, and video information sharing. 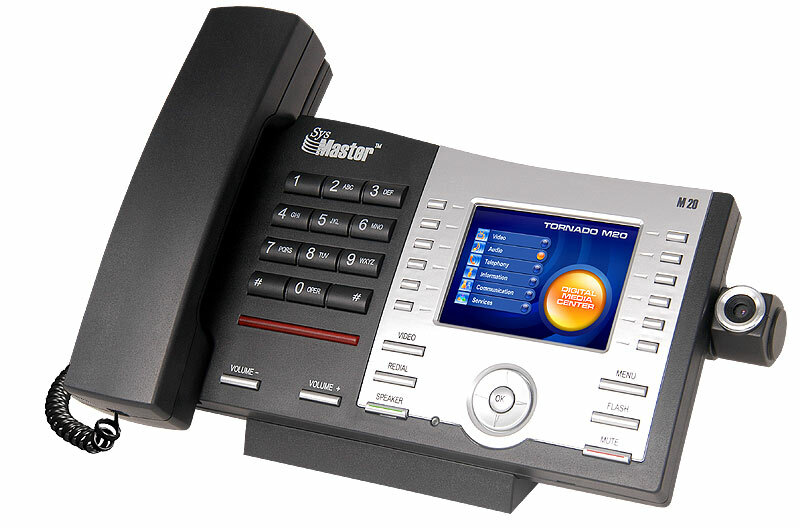 Tornado M20 IP Video Phone supports up to four VoIP lines, each with a standalone IP Centrex/PBX functionality. The IP Video Phone also offers advanced SIP support and can seamlessly interoperate with any SIP Registrar, Proxy or Outbound Proxy server. Tornado M20 IP Video Phone can deliver high quality video streams including online TV (IPTV) and Video-on-Demand directly on its large LCD screen or on a connected TV screen. The device supports the most recent MPEG4 compression technology which enables it to deliver optimal video quality even in networks with limited bandwidth. All video streams are encrypted for privacy and copyright protection. In addition to video capabilities, Tornado M20 IP Video Phone can also receive and reproduce streaming audio content, enabling users to enjoy digital music and Internet radio. Tornado M20 supports high compression MP3 algorithms for maximum quality of the delivered audio streams. Tornado M20 IP Video Phone features advanced Video Conferencing capabilities which enable subscribers to conduct high-quality video conversations with friends and family. To initiate a video conversation, subscribers simply dial the phone number of another Tornado M20 subscriber and enter the video conferencing mode which utilizes the H.263 standard. Tornado M20 IP Video Phone fully supports IP Centrex/PBX features without the need to interact with a central server (i.e. such features are supported internally). The device offers DID, Caller ID, Speed 2-digit Dialing, Anonymous Call Rejection, Call Forward, Call Return, 3-way Conferencing and many other IP Centrex features. The IP Video Phone can be used with any type of SIP Proxy to support Class 5 switching. Tornado M20 IP Video Phone comes with an integrated voicemail system which can accept and record up to 80 calls/messages. Unlike traditional PBX systems which store voicemails in a central server, Tornado M20 stores messages locally and can make them available to users even in cases when the service provider's network is unavailable. The IP Phone supports advanced Voicemail menu system to guide callers during the process of leaving a voicemail, and to allow remote retrieval and administration of voicemail messages. Tornado M20 IP Video Phone automatically discovers its peers located within the same local area network (LAN). Such functionality allows LAN users to talk directly to each other without the need to use third party servers such as Registrars, Proxies, or Gateways.